"There is a quilt in the attic," her elderly cousins said, "and we need to tell you about it." The young woman replied, "Ok, we'll do that some day." Like many well-intentioned plans, "some day" never came. Years later, when the woman disbursed the contents of her now-deceased cousins' home, she came across the quilt in an old trunk. If only she had listened to her cousins' story! I have seen many album quilts during my fifteen years at the DAR Museum, and I have become somewhat jaded over time. But when this quilt was unfolded, my heart stopped. It was magnificent! I spent the rest of the afternoon with the owner trying to identify the designs on the quilt. We compared them with those on album quilts illustrated in books and photographs from my personal files. We searched for a signature or date in vain. The quilt's owner left the museum that day happy and excited about the quilt, but slightly anxious as she contemplated what to do with it. I assured her of its cultural value and advised her to seek an appraisal immediately. The same year, DAR member Opal Backus made a generous bequest to the museum. To honor her, we hoped to purchase a "masterpiece" object in her name. The Mary Simon quilt was the perfect object and we jumped at the opportunity when it was offered. "Her elaborate and sophisticated designs are similar to the complex floral motifs seen on woven carpets popular with the middle class in mid-century Baltimore and elsewhere." 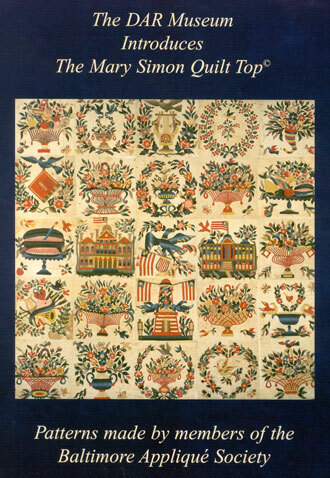 For more information see Nancy GibsonTuckhorn, A Maryland Album: Quiltmaking Traditions 1634-1934 (Rutledge Hill Press, Nashville, Tennessee, 1995, 120). There are twenty-five intricately appliquéd squares that make up the quilt top. Nine are openwork baskets -- a record number for one quilt! Baltimore's famous landmark, the Washington Monument, is illustrated, as is the U.S. Capitol. Another building is unidentified. (This unidentified building is seen in another album quilt from the period.) One of the most charming squares is the epergne with watermelon. The watermelon is sliced open to reveal numerous inked seeds. The carving knife protrudes from the open melon. The cotton fabrics used to make this amazing quilt top are cut and basted to achieve the most realistic and artistic effect possible. These patterns are not for the beginning quilter, and no instructions are included. In keeping with the spirit of Mary Simon, we encourage quilters to be as creative as possible with fabric placement and color choices. The following eight volunteers were instrumental in preparing the appliqué patterns for our second DAR Museum quilt pattern: Anita Askins, Barbara E. Brown, Esq., Jan Carlson, Marylou McDonald, Kay Twit, Polly Mello, Chris Miller, and Kathy Siuta. Recognizing the importance of this amazing quilt, these generous needle artists spent countless hours carefully tracing the designs from the original quilt top. Their dedication to preserving the art of appliqué for future generations is crucial to one of the missions of the NSDAR - preservation.